Whether it’s lifting weights or going for a run, some form of physical activity is usually good for your health and wellbeing. Regularly moving may help you maintain a healthy weight, prevent the development of depression, keep your hearts healthy and even help you sleep better. (And yes, sitting for long periods of time (for example while at work or watching TV) can be detrimental to your health. This is why it is necessary to stand and move throughout the day). 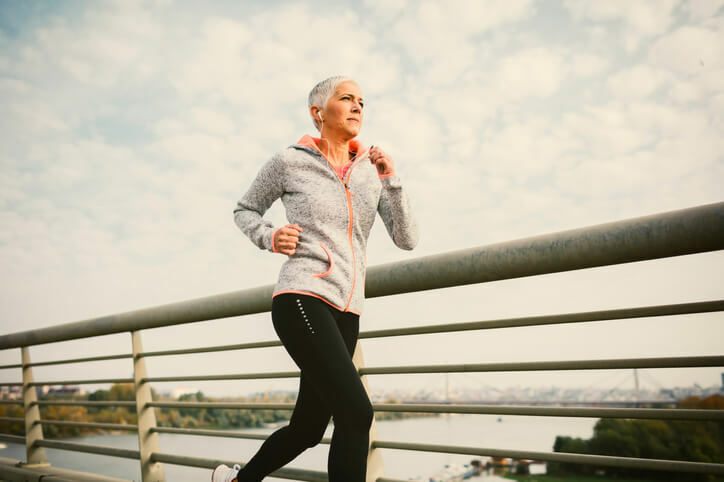 But what you may not know is that there is credible evidence to suggest that endurance exercise (for example, running for a long time) may have significant anti-aging benefits too - perhaps even more than resistance exercise (such as lifting weights). Want Proof? It’s All in the DNA. “Our DNA is organised into chromosomes in all the cells in our bodies. At the end of each chromosome is a repetitive DNA sequence, called a telomere, that caps the chromosome and protects its ends from deteriorating,” according to a report on the study. In other words, your lifespan is generally reduced with shortened telomeres. Study participants included 266 young and healthy people who had previously been inactive. They were randomly assigned to do six months of one of the types of training mentioned. The endurance group did continuous running, the high intensity interval training group did sprints (slower running followed by bouts of fast running) and the resistance group did circuit training on different types of weight machines such as chest and leg press and seated rowing machine. There was also a control group who remained inactive. Results revealed that endurance and high intensity exercises slowed or even reversed cellular aging, while resistance training did not. “Our main finding is that, compared to the start of the study and the control group, in volunteers who did endurance and high intensity training, telomerase activity and telomere length increased, which are both important for cellular aging, regenerative capacity and thus, healthy aging. Interestingly, resistance training did not exert these effects," said one of the leads on the study. “Released by the inner layer of cells (endothelium) of blood vessels, nitric oxide relaxes the vessels and keeps them flexible, allowing them to dilate, boosting blood flow, and helping to control blood pressure. Nitric oxide also has anti-inflammatory effects and helps prevent platelets and white blood cells from adhering to the lining of blood vessels, thus reducing the risk of plaque development,” reports Berkeley. These findings might explain why endurance and HIIT training may be especially good for heart health. In addition to this, as we get older our cells make less nitric oxide. And as a result, blood vessels become less flexible which can increase the risk of developing hypertension and atherosclerosis (plaque build-up). Resistance Training is Still Necessary. This study revealed some very interesting information on how different types of exercise may impact your bodies. However, resistance training should still be an important part of your physical activity regimen. The study emphasized that in no way should resistance training be replaced with endurance or HIIT training. The three forms of training identified are important and compliment each other. Strength training is necessary for maintaining healthy bones. “Numerous studies have shown that strength training can play a role in slowing bone loss, and several show it may even build bone. This is tremendously useful to help offset age-related declines in bone mass,” according to Harvard Health. Resistance training helps build muscle (and you lose muscle as you age) and, in turn, this helps build and maintain strong bones as well as reduce the risk of osteoporosis. Resistance training may also help prevent age-related falls that can occur with muscle loss. Avoid Aging Accelerators When Possible. Aging is a natural part of life, but be aware of the things that you can control to diminish cellular aging. For example, smoking, drinking too much alcohol and having a diet with a lot of inflammatory foods (like sugar and processed foods) are definitely ways to accelerate the aging of your body’s cells. Along with working out (and incorporating both endurance and strength training), follow a diet with plenty of fruits and vegetables. These foods are nutrient-dense and have anti-inflammatory properties which can prevent oxidative stress and delay aging. And if you need a cosmetic reason for motivation, these foods have been associated with the reduction of wrinkles. Other Factors to Keep in Mind. If you have an existing heart condition or any other health issue, it is always a good idea to consult a competent healthcare professional about the types of exercise which might be appropriate for you. And remember, fueling your body properly is imperative for workout performance and recovery. Lastly, I would highly recommend getting routine nutrient tests. Maintaining nutritional balance and a healthy weight are important for anti-aging and the prevention of disease. If nutrient tests reveal you have a nutrient imbalance or deficiency, a competent healthcare professional can work with you to change your diet and recommend quality supplements you can take if necessary.